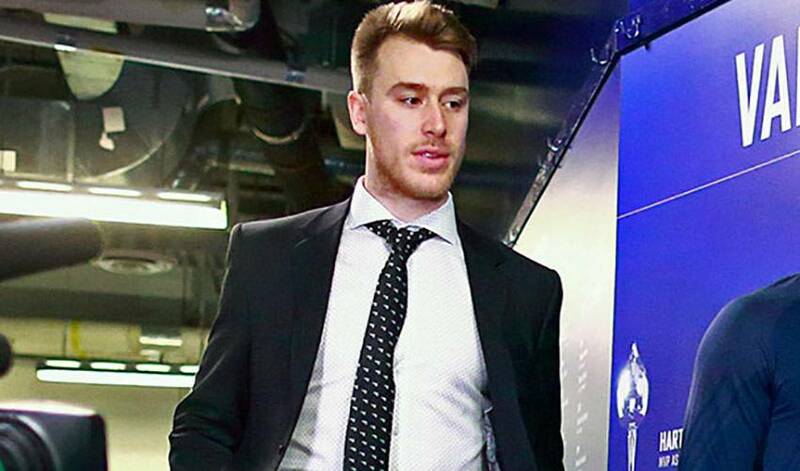 Shawn Matthias is certainly not unfamiliar with donning the blue and white colours of the Toronto Maple Leafs. But, these days, it’s more meaningful than ever. There was no reading between the lines when it came to the @ShawnMatthias tweet that was posted at 11:13 a.m. on July 6. In fact, it was pretty obvious how the free agent forward felt in the moments after he signed a one-year deal with the Original Six club. All smiles today! Grew up cheering for the @MapleLeafs couldn't be happier to play for my hometown team! Can't wait to throw on that jersey! Matthias had plenty of experience doing exactly that in his younger days. Pretty sweet, indeed, for a player coming off a season in which he scored a career-best 18 goals, third highest on the Vancouver Canucks, while spending just 16 minutes in the penalty box. Matthias was selected by the Detroit Red Wings in the second round of the 2006 NHL Draft, and was dealt to Vancouver as part of the 2014 trade that saw goaltender Roberto Luongo head to Florida. In 408 career games, Matthias has recorded 131 points, including 69 goals. Don’t expect to see Mathias filling out his résumé any time soon. No word yet, however, if Matthias and his girlfriend have fitted their new black lab pup, Rocky, with any Maple Leafs gear.